One of the most common issues we see here in the Graduate School are forms being filled out and submitted incorrectly. We hope that this upcoming series of blog posts will clarify how our dynamic forms work and reduce the stress on you, the student, when filling them out. Today’s topic is the Pre-Defense Form. This form must be submitted to the Graduate School two weeks prior to your thesis, dissertation or report defense. The Pre-Defense Form can be found on the Degree Completion Timeline, on your MyMichiganTech, or by following this link. Please note that the Pre-Defense form, like many of our forms, is dynamic. As a dynamic form, it will only work in Adobe Acrobat or Reader. If the hyperlink above doesn’t open the PDF as expected, we recommend right clicking on the link, selecting “Save link as…” (or similar option in your browser) and saving the file. If you are still having trouble opening the form, check out this link which offers some more troubleshooting options. After you have saved the file, open Adobe Acrobat or Reader and open the saved form. The first few blocks are pretty self-explanatory; enter your last name, first name, optional middle initial, and M Number in the appropriate boxes. If you do not know your M number, fret not, you can always find it on MyMichiganTech. The Google Calendar makes it easy for you to invite Graduate School staff to a meeting. In particular, it is recommended to make an appointment with Debra Charlesworth to discuss your final thesis or dissertation questions. Making an appointment will ensure the appropriate staff are available, and that we are prepared to meet with you. You are also welcome to stop by anytime, particularly when Dr. Charlesworth’s schedule shows that she is available. To start, log into the Google Calendar. Navigate to google.com/calendar – log in with your full MTU e-mail address and password. Canvas is the learning management system that Michigan Tech uses for classes, and the Graduate School uses to collect theses, dissertations, and reports. This post will explain how to submit an assignment for the Graduate School. 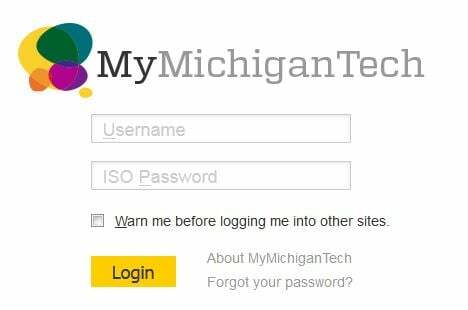 First, log into Canvas by visiting http://mtu.instructure.com and logging in with your Michigan Tech ISO ID and password (the same one you use to access Banweb or your e-mail). The Canvas log in screen. Use your Michigan Tech ID and password. Graduate School forms submitted by students are electronically stored in Perceptive Content (formerly known as ImageNow). All member of the graduate faculty and authorized staff may access these forms by opening the Perceptive Content program, and logging in with their Michigan Tech ISO ID and password. Students do not have access to Perceptive Content. Dissertation, thesis, or report reviews are available to students through Canvas (for pre-defense documents) or Digital Commons (for post-defense documents). Faculty can also choose not to utilize Perceptive Content to access the student’s review. These faculty may ask their student to share the review file with them, or contact the Graduate Program Assistant for access to the file. The email notification lets the faculty member know that the review is available. Make sure you have a campus IP address. You either need to be on campus, or establish a VPN – contact IT for support. Make sure you allow pop-up windows in your browser. Your browser and Java must be compatible with the web client. If the screen is blank when you load in a web browser, try a different browser. Contact IT for support if that does not solve the problem. Ensure your browser is set to open PDF files using Adobe Acrobat or Reader. Alternative PDF viewers will not open the review files properly. Contact IT for support or see our web tips. There are a limited number of licenses available. Please disconnect when you have completed your session.